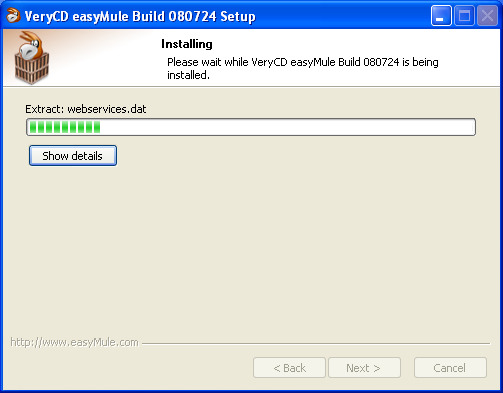 How to download and install the easyMule? How to use easyMule to download? How to improve the speed of download? Why some files are unable to be download? How to share the file to download for the friend? How to search for the download content wanted? What advantages does new easyMule have? 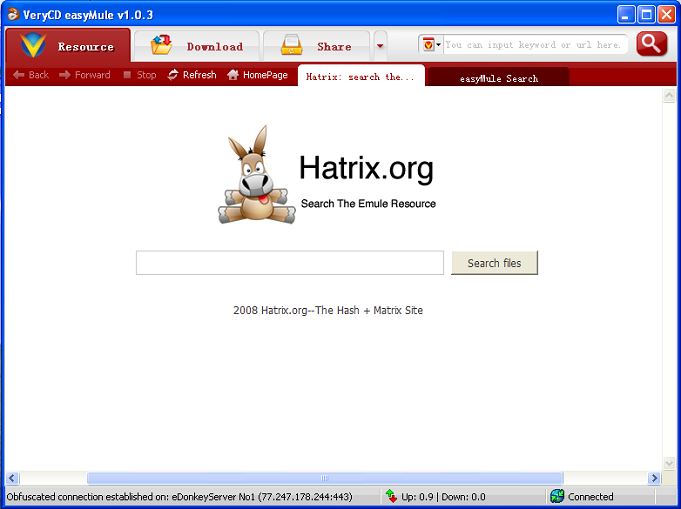 The easyMule is free open source software, using the easyMule to help your to search, download and share various resource on Internet. 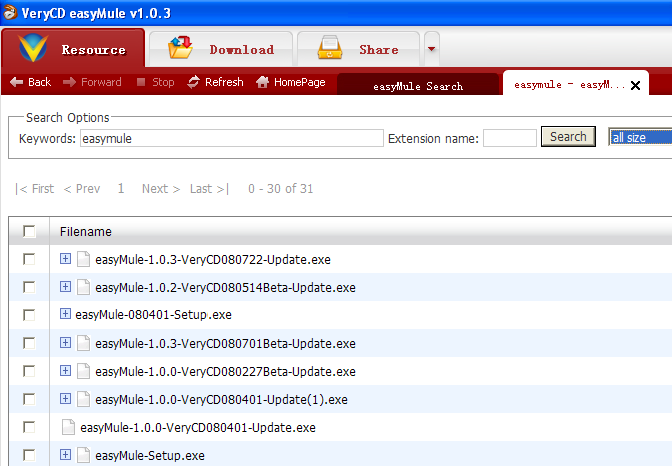 After getting our software, open the file which contains easyMule, double click to run. The first step: Entering install and welcome interfaces. As shown in Fig. 1.1, click "next” to continue. 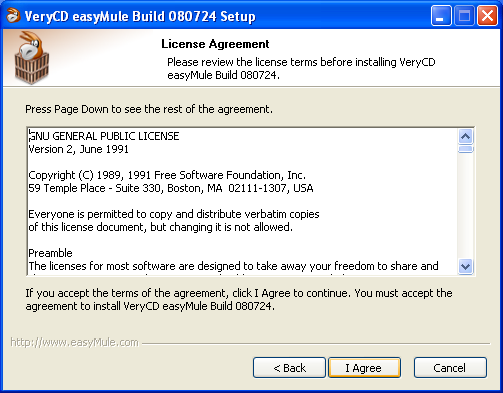 The second step: Enter the license agreement interface, as shown in Fig. 1.2. If you accept the clause in the agreement, click “I agree “Continue installing. Otherwise please click "Back” to preview step or “Cancel "to exit. The third step: Choosing what you need to be installed. As shown in Fig. 1.3, click “next" to continue. The fourth step: Choose the installation path you want. As shown in Fig. 1.4, set up and finish, click “next" to install. The fifth step: You can click “detail" while installing to check the detail of installing. As shown in Fig. 1.5, click "next" when the installation was finished. The sixth step:In this interface you can choose if run the easyMule immediately, as shown in Fig. 1.6, clicks "finish” to exit the installation. Besides supporting to traditional ed2k protocol,the easyMule can also support http, ftp,etc. download protocol perfectly. The second step: Click to download the chosen source directly, eMule will add chosen resource automatically. New easyMule have great improvement in speed of downloading, after installing the newest easyMule, you do not need registered user or any establishment to enjoy the high-speed fun of downloading. EasyMules is a section of P2P software advocating sharing, software has a set of total marks mechanism, reward to user that upload actively,uploading while running easyMule, upload the more, download the more quickly. And a same file, the more people downloading are, the quicker the speed is, you can recommend the easyMule to your friends, let everybody participate in sharing together, I help everybody while everybody helping me! The easyMule was special optimized about read and write the hard disk, the impact of downloading on hard disk and is the same as using normally, needn't afraid the hard disk will be damaged because of this. Because the easyMule uses Multi-Thread downloading technology, divides the file into many one to download at the same time. The fastest part will be finished at first, and the slowest was often to be leave at last. The new edition easyMule has already begun to use some intellectual technology to solve the problem, if meet this kind of situations, try to restart the task. There many reasons, because the content that the easyMule downloaded was often offered all by net friends, may download hardly or a low download speed when the file was just released, please wait patiently, or try to choose the hot resource that is recommended in the software resource column. If really unable to download, you can choose website of us go on, search for relevant resource find effective address carry on download, perhaps you will also find more useful resources! 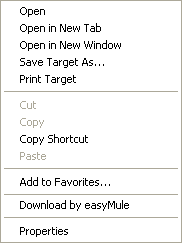 The easyMule can share the files in your PC to fridens to download. Concrete please consult the easyMule and share the guide. 1.Input the resource name to search in the upper right corner of easyMule, you may choose searching from http://www.VeryCD.com (recommended) or though the server in the pull-down menu. Acquiescence is the former. 3.Using easyMule: in ”resource” page there is “easymule search”, use it! 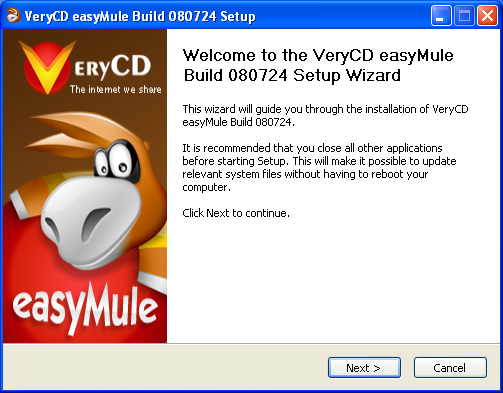 Just as mentioned before, VeryCD easyMule is the redaction developed in a totally new way on the basis of eMule, have faster speed of download, more simple and more convenient operation interface, and more newly-increased humanized functions. The easyMule is a totally free P2P open source software, You can use it to share the things with the others, utilize the easyMule to make all computers and servers of the world to be an enormous resource to share the network. Users can also search for resources what you want and download it from many peers at a really HIGH speed. 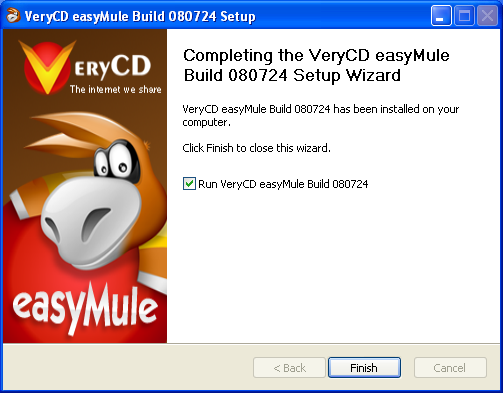 VeryCD easyMule is developed in a totally new way on the basis of eMule, it download at a faster speed, more simple and more convenient operation interface and more newly-increased humanized functions, even though, all of these are free and Open Sourced. Share continuously, I help everybody WHILE everybody helping me!